The Harvest Goddess is the keeper of the Homeland. She is there to make sure that things stay in order and in peace. The Hero (you) is the only character that can see her, feel her, hear her, talk to her, etc. The Harvest Goddess lives up in the mountain up in Harvest Goddess Lake. You can call to her and make a wish, or find out clues to some of the endings. You are allowed up to one wish per day, and to make a wish you must use something from your farm (Egg, Milk, Crop, etc). Go to the Harvest Goddess Lake and stand in front of it. Then throw the item you wish to offer into the Lake and the Goddess will appear. She will then ask you which of the following you would like to wish for. Make your wish and then she will take care of that wish. Don't always assume though that your wish will turn out as you would like it. When you start an ending, usually the Harvest Goddess will be able to give you some pointers to aid you in your Endings Marathon. Go to the Harvest Goddess lake, sometimes a cinema will come up with her giving you clues. Other times you may make an offering and she will help you with what you need to know to complete the ending. Below is the list of the 5 wishes you may make. Energy: This wish is used to restore the Hero's stamina for that day. You will use up your stamina throughout the day doing various acts and if your supply of energy goes away, you won't be able do to anything. Make sure to keep an eye on your stamina levels. Fatigue: This wish is used to remove the Hero's fatigue for that day. Throughout the day while doing strenuous acts, your character will build up fatigue making him loose stamina quickly. Make sure to keep an eye on his fatigue levels. Girl: This wish is used to strengthen the Hero's relationship with one of the five girls in the Homeland. The girl that you have the best relationship with is the one that the Goddess will help boost. Note that you cannot get married so the heart system doesn't work in this game, although you can get the girls to like you. Be careful though, because the girl you want to increase your relationship with isn't always the one the Goddess chooses to increase (you don't choose, she does). 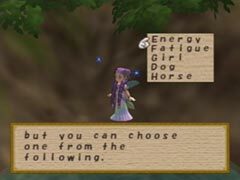 Horse: This wish is used to help increase the amount of hearts that the Hero's Horse has. The more the horse loves the Hero, the faster the horse will be able to run. Be careful with this one though, because 1 out of 5 times the horse's heart rate will go down (no reason to this, just random, don't abuse this wish). Dog: This wish is used just like the horse wished, only on the dog. It helps increase the amount of hearts that the Hero's Dog has. The more the dog loves the Hero, the better it will be at finding things and performing tasks (flute calls). Be careful with this one again, because 1 out of 5 times the dog's heart rate will go down (no reason to this, just random, don't abuse this wish).